Pottery Barn has some adorable shell candles. I want them. I don’t want to spend any money. So…. I love PB’s shell candles. In a previous post, I explained how I can use every single bit of my candles. I did the same thing here, using old candle wax, wicks from the craft store and a few shells that I already had. Take the wax and put it in a microwave proof bowl. In a perfect world, I would have had plain white wax for this project, but alas, it is not a perfect world. However, some of the wax was my favorite Tuscan Basil scent, so at least my imperfect world smells like Tuscany. Microwave the wax in 30 second to 1 minute intervals, gently swirling the wax in between heatings. You will probably need to use a pot-holder to handle the bowl. In the meantime, take the shells and prop them up/steady them. I used rice on a plate to support them so they don’t tip over. Since the bottom of the shell is curved, you might need to bend the wick at an angle when you place it in the shell. Let them sit and harden. Clean off/scrape away any wax that might have run onto the outside of the shell. I wanted to use sand like the picture in the Pottery barn catalog, but unless I wanted to vacuum my car’s interior to try and get some leftovers from our last beach trip (which I didn’t) or go over to the beach (which I didn’t) I opted to use sea-glass type filler instead. The best part? That they were pretty much free. Give it a try. Cheap, easy, and it smells good too! These were featured on Knock Off Decor. I LOVE your candles and thanks for a great tutorial!! I can’t wait to make some not only for myself, but as gifts!! I have wanted to try this forever…maybe some day I’ll get around to it! I think your’s is prettier than the PB one! I love the color your wax turned out to be, and I’m sure it smells great! Great idea! They look so pretty and I love the beach glass. Love it and once again you make it look so stinkin easy! I love that your imperfect world smells like Tuscany!!! :-)) Even in all its imperfection, our world is pretty great, huh!! And your creative ideas make it even better!! Thanks for sharing!! this is genius, i love your DIYs. you make the crafts possible that i love in the store but don’t want to risk doing myself, but having you do them first gives me a guide. What a great idea! I love how yours turned out! Love these V! I’ve got some shells and I’m going to give it a try! Visiting from It’s So Very Cheri blog hop! Me likey! Really beautiful, and I just happened to buy a load of shells that need to be put to good use. Thanks for the inspiration! Great ideas…I once taught this craft in a class.Wish I had thought of the idea of balancing the shells in rice. Brilliant!!! Love, Love, Love this idea! Thanks for showing us how to make them ourselves. SO pretty! Thanks for the information and especially smart of you to prop them on rice to fill them!! Love the sea glass and the way you’ve displayed them too! You are too smart lady! These are great. My daughter just collected bunches of shells from her first trip to the beach and we can totally make these one afternoon while little bro naps! Thanks for the idea. Wow, what a brilliant idea! Thanks so much for the excellent instructions and tips. I am definitely trying this asap! Somewhere in a box….I have a whole bunch of candle making supplies. I wonder if I will ever see that box again. Niiiiice. I love that you added the sea glass. You have amazing talent. Very pretty! 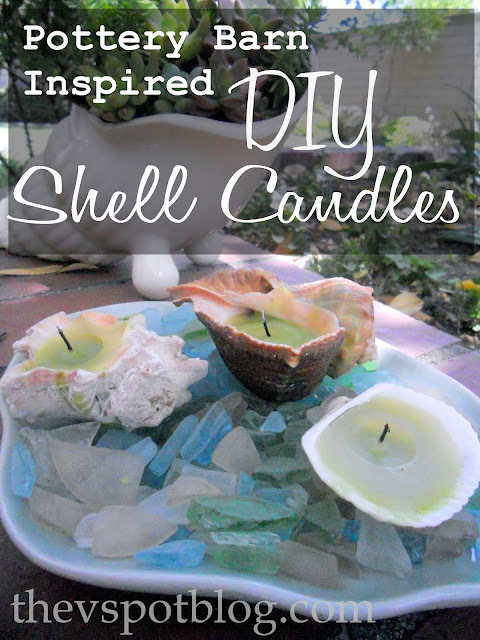 I have a lot of candle wax (also make candles), but haven’t thought of putting wax in sea shells. Thanks for the idea! Very cool! Following you from the hop. These are darling! I love pretty much free! Great idea to reuse up old candles, too. Great knock-off and so pretty! What a fun idea! Love the use of sea glass more than sand! Aren’t you smart? 🙂 Seriously, that’s a really awesome idea to use up your candles, and I love your shell candle knock-off. My summer decor is out and it just happens to include a tone of shells. This will be a perfect project for the girls! Cheap, easy and smells good… that is priceless! What a GREAT idea! And now I know how to use up my scraps of candles, too! Thanks for sharing this! i have a little shop nearby that sells shells of all shapes and sizes very inexpensively. i’ll definitely have to go by and pick up something pretty so i can make this craft. perfect for us as we live by the beach. Oh my word. You are way more clever than me. Brilliant! I have so many “scrap” candles lying around the house. I never want to throw them out ’cause I just KNOW that some clever lady will show me a way to continue using them! Great idea. Thanks for sharing! I LOVE yours much better than Pottery Barns! They are So Sweet! I will definitely make these! Thank you so much for the inspiration AND instructions! I’ve given you the Fabulousity Friday award at Sweet Tea Serendipity! I’m with MiMi, like yours better than PB. Thanks for sharing! Viv, I absolutely LOVE this project! Beautiful, and so well put-together! This is a wonderful tutorial! Thanks so much Vivienne!! They are just the sweetest, and perfect for summer decorating!! Great project! They look fantastic! I saw these at PB and loved them! This is so fun! I never thought about making them myself. Definitely on the to make list. What a fun idea!!! I am visiting from Tatertots and Jello and I would love if you would link this up this weekend to my Delicately Constructed Fridays linky party!! I swear I’m not kissin’ up to you for any reason. ‘Can you HANDLE being featured at my place AGAIN?’ My daughter voted on the links first so…it’s fair. I just agreed > it’s feature-worthy. As your stuff always is. This is beautiful! Wonderful job!! Awesome!!! We live at the beach and I have been finding whole shells lately! I was thinking of doing the same thing. I love how you displayed them. They look fantastic. Excellent table decoration. I’m having fun going through all your beach inspired posts! I love this one! It’s now on my to-do list!